There's always been questions and there's always answers. But then there are some questions for which there are no answers because it's all the figment of human imagination. But when in a mess a human mind turns to all possible solutions. 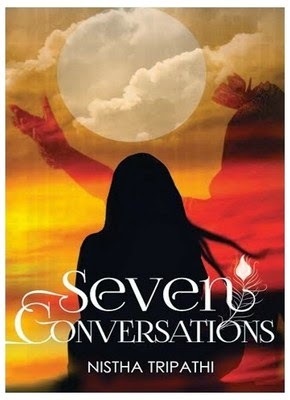 Author Nistha Tripathi in her book "Seven Conversations" tries to leap out of the comfort zone and give more insight to what's life and what's existence. So has she done it to perfection? Let's find out. Seven Conversations is a thought experiment on life and existence. The characters might be fictitious but their questions are not. What happens when we choose happiness over convenience? For Meera Sachdev, choosing a divorce at an early age of thirty over a comfortable and convenient life was a leap of faith. Leaving her successful career and friends behind in the United States, she returns to India where she is now reduced to a failed woman who could not save her marriage. As self-doubts and the realization of the suffering she has caused her loved ones overwhelm her, she begins to crumble. Her call for help is answered by none other than Krishna - The Lord who is all-attractive. Her odyssey will take her through the temples of Vrindavan, the mythical City of Justice, a deserted barn and the Himalayas as she unearths her deep spiritual roots and the divine truth. In seven pivotal conversations with Krishna, friends, father, teacher and herself, she rediscovers life, love and her own identity. Beware, after reading the book, you might dare to choose happiness yourself. Are you prepared? First look at the title and the cover and one can feel calm. The title is an intriguing one and hints at something deeply spiritual and to make truce with the human mind. The cover image is a mix of a lost and pleading soul yet could have been done in a more tasteful manner. The blurb talks about life and existence of a soul on earth. Some questions which are best left unanswered because no amount of explanation can put an end to the dilemma. It's a good blurb giving out the summation of the story. The story is set off in India where Meera Sachdev has just returned from U.S after leaving her plush job, a bitter divorce and a lot of agony and a dark future. She is marred by the society and feels unwanted as pressure mounts from different sides. The undecided mind runs into an overdrive and her parents try their best to get the burden off her mind. But a journey to the sprawling Vrindavan and a meet with her saviour Krishna through various mediums gives her a new direction. But is there a new direction? Will she accept the past and move on? Is there something to salvage out of her life? Will she be able to find god and peace and a purpose for her existence? That's what the story is all about. The spiritual and deep connect of the human mind with god and it's holy secrets hidden across many mediums of life forms is a thing to cherish in the story. The connect with Krishna and the innocent monologue of a lost soul is a revered touch to the miserable existence. The book imparts happiness, spirituality and other religious teachings through it's own eyes. It never forces you to undertake something to which you don't feel connected. The book keeps a calm and fluid perspective to what a human can do when they are completely down and out in life. There's a midas touch and meaningful rendition as to what one searches for and plausible explanations regarding it. The downside of the book is it feels rushed at times and the initial narration doesn't gives a greater insight about the connect. The conversations feels little incomplete and there's a craving for more deeper insight which doesn't quite gets satiated through simple and brief learnings. The book could have more content covering a few more aspects and more in a question and answer form rather than casual conversation at times. All in all the book keeps the sanctity of religion, spirituality and a fickle human mind alive. It tries to make truce between the three through various connects and succeeds up to a certain level. The book gives you an idea of how to approach life and how every existence is important on earth. The book could have been given a more elaborate touch but whatever it manages in this entire narration is no less than serene. The conversation be it seven or one is there to enlighten the mind. A hopeful book.